INDUSTRY.co.id - Jakarta- Ministry of Cooperatives and SMEs should be upgraded to become the Coordinating Ministry of the People's Economy. Because the function of the Ministry of Cooperatives and SMEs has always been regarded as a ministry devoted to take care of cooperatives and SMEs. While the responsibility of empowering cooperatives and SMEs in ministries and other state institutions are not considered. "Whereas the crucial problem is how the development of cooperatives in all sectors of the economy," said Suroto cooperative counsel on Wednesday (09/08/2017). Suroto who is also Chairman of the Association of Socioeconomic Strategic Cadres (AKSES) exemplifies, the problem of empowering fishermen. "The farmers are in the ministry of KKP, the problem of livestock and agriculture is in Kementan, the problem of the people's industry is in the Ministry of Industry and many more that the ministries see only the three or four echelon functions. No serious commitment from the Ministry or Institution (K / L), "he said. As a result the problems of fishermen, farmers, farmers, craftsmen, small traders and the base of economic life of the people so far, as if everything is concentrated to the Ministry of Cooperatives and SMEs. While other ministries seemed to wash hands. In fact, some have come up as sectoral ego. For example, the Village Ministry and PDT ignore the entities of cooperative legal entities when developing BUMDes. Suroto further explained, other sectoral regulations also lock the ministry of cooperatives and SMEs, by discrimination, subordination and even eliminate it. The most concrete example at the level of the law such as the Law on State-Owned Enterprises which requires corporations Persero, then the Hospital Act is the same. Even up to the level of Candy like Permendes about BUMDes which must be a legal entity Persero. "This is why the cooperative as the base of our people's economy is not growing and its contribution is very small to the Gross Domestic Product (GDP)," he said. Currently the contribution of the Cooperative to the PFB is only 4 percent. This small contribution is deemed inconsistent with our constitution whose message is to develop an economic democracy in which the cooperative is a suitable enterprise. This has become one of the reasons why cooperatives in Indonesia are not developing properly. 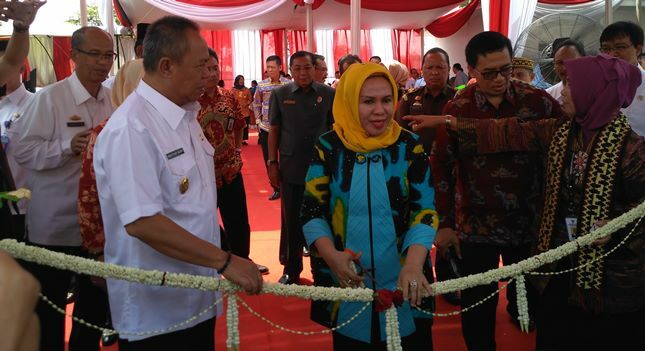 Amid the various obstacles above Suroto assess, the performance of the Ministry of Cooperatives and SMEs is now good under the leadership of Anak Agung Gede Puspayoga, with a total reform program, which includes the rehabilitation, rehabilitation and development of cooperatives. "At least there are efforts to rehabilitate the image of the cooperative," he said. This can be seen from attempts to dissolve a nameplate cooperative and to oversee the shirt-lined shoemaker, which has not been done in the history of the Ministry. Then reorientation efforts where the cooperative is directed to quality not quantity, and the development of various cooperative efforts. "The total reform of the cooperative has even received appreciation from neighboring countries such as Timor Leste who want to imitate this concept of total reform," he added. According to Suroto, the national consolidation of the people's economy will not happen if the pattern is still what it is today. Kemenkop will face problems from colleagues in other K / L.
According to him, cooperative development efforts will not be possible with the current functions and regulations. Therefore the President must do something unusual. Out of the box. "For that my proposal, the Ministry of Cooperatives and SMEs should be upgraded to become a kind of coordinating ministry and then to strengthen its mandate immediately established a new Cooperative Law already in Parliament," he said. But because the draft has been suspected of many narrow interests, well made just Perppu. It also qualifies, because after the abrogation of Law no. 17 Year 2012 on Cooperatives by the Constitutional Court, Law no. 25 Year 1992 also is not sufficient for the development of cooperatives. If you wait for the new law to be born too long and its mission will not be achieved. Well, after a good reshuffle under the Perppu or UU it immediately formed a kind of PP and Keppres to encourage the emergence of national policy cooperatives in order to be guidance for the development of cooperatives throughout the K / L as well as the community. Cooperatives in other countries are not just social conglomerates, their role is very strategic because it makes the economy more just, sustainable, ecologically able to maintain political stability because it brings the mission of peace.